The place for parts & services: Modifications, Spare Parts and Repair Services, Sample Packs, Accessories. Cards are currently out of stock! - Sign up for the third batch at https://sagamusix.de/other/roland_memory_cards/ - this is not a binding pre-order, you just sign up to be informed about the availability of the next batch. The cards will most likely cost 79€ each, shipping will be between 5€ and 10€. So, as everyone knows, these old M-256 / 32KB and M-512 / 64KB RAM cards for Roland synths (I'm sure the same applies to others as well) sell for ridiculous prices (like 50€+ on ebay), given the amount of RAM you actually get. We want to change that! To be precise, I always wanted to have quick access to multiple memory banks in my Roland D-50, but I'm not aware of any cheap off-the-shelf solutions, so I was reaching out to a friend to help me make this dream come true. 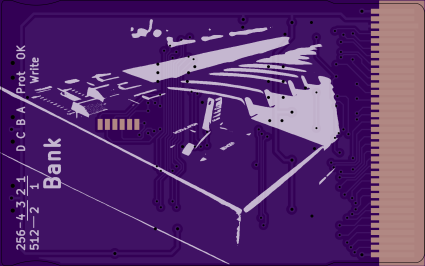 We are currently planning out things, and have decided to go for a custom card with MRAM chips (so it won't need a backup battery) with a built-in bank switch. This makes it easy to have access to many sound patches without having to constantly switch between banks via SysEx upload. Once we can confirm that this design works, we want to make other Roland synth owners happy, too. It would be interesting to know if there is any demand for such cards, so please post here if you're interested in getting one. We cannot give an exact price for the cards yet, but you can expect that they won't cost much more than what you'd pay on eBay for an original card, while providing 16 times the space. Our new cards should work as a replacement for all M-128 / M-256 / M-512 card revisions, they have been confirmed so far to work as a replacement for revision D and E (i.e. M-256D and M-256E). The memory cards also work as Akai BR-16 and Akai BR-32 replacements! Subscribe to this thread for updates. Last edited by ʝɵʝɵ on Sat Nov 03, 2018 7:07 pm, edited 23 times in total. I'd definitely be interested in something like this - just picked up my D-50 finally, and I'm finding tons of great patches for it. Once it is good for Roland JD800/JD990 (natively supported cards AFAIR are M-256e, so I'm not sure about the M-256d) - I'm interested. Also, would it require removing the card from the slot in the synth then reinserting it each time you need to switch banks? If so, it would kill 90% of the idea through destroying immediacy... Easy reachable buttons allowing to hot-switch banks - like the floppy emulators do - would be best. I don't like the drums, but the drums like me! I suppose that it would be equally simple to build a M-256E replacement - I suspect it's using similar technology, but I wouldn't know for sure. Thing is, someone previously reverse-engineered a M-256D card and posted schematics of how to build your own identical card. We used this as a base for our new card. If something similar can be found for the M-256E, it would probably be feasible to make one of these as well if there's demand. Edit for anyone trying to use the linked schematics: Whoever created those schematics made a mistake in calculating the dimensions - the card contacts should be 1.5mm apart, not 1.27mm! There are also a few more gotchas. Also, would it require removing the card from the slot in the synth then reinserting it each time you need to switch banks? The switch is placed on the end of the card that sticks out of the synth, so it's easy to switch banks. I have to say here that the card is not finished yet so I haven't got the chance to test it yet, but I'm 99% sure that "live bank switching" should work by simply using the switch and then dialing in a new program on the synth, as you require it. At least as far as I understand it, the validity of the card is checked when trying to load a patch, not when inserting it. Last edited by ʝɵʝɵ on Thu Mar 10, 2016 2:05 am, edited 2 times in total. The D-550, JD-800 and JD-990 only need a 256k card. It is a waste to use a 512k card since they won't see the remaining storage space. I have used different letter cards with no problems. The letters seem to be revisions of the cards with no changes to storage or pinouts. Just format to a particular synth and store away. In related news, I think I could make the card convertible, so that it could pose as an M-256* with 16 banks or as an M-512* with eight banks, just by changing a solder jumper. Anyone out there with a synth that needs a 512 card? If yes, I would need someone with an M-512* card to perform a simple, non-destructive and quick experiment on their card involving a multimeter to confirm a theory I have. Very nice! If you do a M16C (not sure how easy that would be?) I'd totally buy one. I would quite like a M-512E substitute for my JV-1080. Are you aware of a very similar project for Yamaha cards? A rotary knob like on that card could be a practical way to select the bank. How are going to make the casing? Or do we have to send you original cards for conversion like Sector101 does for the Yamaha cards? baz99 wrote: I would quite like a M-512E substitute for my JV-1080. Cool, I actually designed that option in last night, though I can't be 100% sure about the M-512 pinout. Got an original M-512 and a multimeter for a quick (non-destructive) experiment? baz99 wrote: A rotary knob like on that card could be a practical way to select the bank. That's pretty nifty indeed, but goes beyond the amount of effort I was planning to put into this. I was going for a pair of slide switches with four positions each and label them A..D and 1..4 so you can select sixteen banks from A1 to D4. The advantage of that (apart from easier layout) is that it's possible to build a cheaper model with only four banks using the same board layout and just replacing the MRAM chip and omitting the A..D switch. baz99 wrote: How are going to make the casing? What casing? Seriously, I wasn't planning on any casing; just a bare circuit board with parts on it. If you're worried about static discharge or just want a nicer looking memory card, you can always make a poor man's case out of heat shrink tubing, or someone could design a nice 3D printed case. I will put a few mounting holes into the board so it can be retained inside a case. dojoe wrote: Cool, I actually designed that option in last night, though I can't be 100% sure about the M-512 pinout. Got an original M-512 and a multimeter for a quick (non-destructive) experiment? Yep, tell me what you would like me to check. No problem, that should work fine too, I just mentioned that Yamaha clone card to give you ideas. Without casing is fine by me, I don't care about looks and can handle the card to avoid static discharge, I was just wondering how you make sure that the card is the right thickness so that the contacts on the front sit firmly in the slot. I will put a few mounting holes into the board so it can be retained inside a case. That would be useful, to facilitate adding a casing for those who want it. Use only in appropriate products. 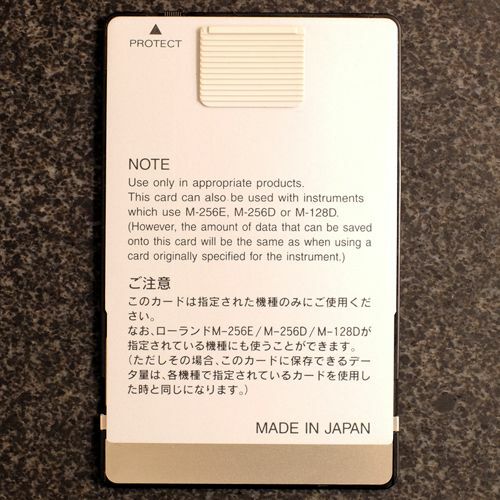 This card can also be used with instruments which use M-256E, M-256D, or M-128D. So I guess that means the cards are all compatible. baz99 wrote: Yep, tell me what you would like me to check. There should be 34 contacts, numbered 1..34 from right to left in the picture. The contact that's slightly longer than the others is number 32. I'm interested in the resistance (i.e. Ohms) from contacts 16, 17, 18 and 19 to contact 1 (supply voltage), and from those same contacts to contact 32 (ground). I know that number 16 carries the highest address bit for the M-256, and my theory is that the M-512 simply has an extra address bit on number 17. I'm hoping to see that contact 17 is more similar, resistance-wise, to 16 than to 18 or 19 (which are unused). baz99 wrote: I was just wondering how you make sure that the card is the right thickness so that the contacts on the front sit firmly in the slot. dojoe wrote: I'm interested in the resistance (i.e. Ohms) from contacts 16, 17, 18 and 19 to contact 1 (supply voltage), and from those same contacts to contact 32 (ground). Sorry for the delay. I have done the measurements now, these are with the battery inserted (not sure if you want them with or without battery). from contact 1 to 2 - 17 it's always 23.9 - 24 kOhm, to 18 and 19 it's infinite. from contact 32 to 2 - 17 it's always 48 - 50 Ohm, to 18 and 19 it's infinite. So yes, it looks like contact 17 carries the highest address bit on the M-512E card.